The Moon is in Leo through Saturday, January 14th, 10:53pm ET. Today, she is unaspected giving us a special day, one that I refer to as Diva Day. Leo is all about letting your own inner light shine for all to see. Diva Days are made for pampering yourself, allowing yourself to feel like a movie star, and accepting all the love and adoration that comes your way. Accept it, enjoy it. During this Full Moon Phase, we have lots of blessings on our side to make it a glowing day. Today, Friday the 13th, is Frigg’s Day. Fear of Friday the 13th is called friggatriskaidekaphobia. Fear is unwarranted, however, because it’s loaded with some very positive feminine energy. Saturday, the 14th, sends the Moon lots of positive energy, too, with supporting aspects from Uranus (invention), Jupiter (increase), and Saturn (stability). Some crystals of Leo to enjoy are tiger’s eye for courage, sunstone to dissipate fear, and citrine for cleansing and healing. The lion’s tooth pendant in the pic is made of amber which opens channels for joy to enter. Daisies are a flower of Leo. Hearts have a double meaning. They represent love, both given and received, as well as the heart that beats within our chest. Physically, Leo is associated with the heart and the spine. Love and courage, a nice mantra to live by. The Tarot Sun depicts the childlike joy associated with Leo, as well as actual children. 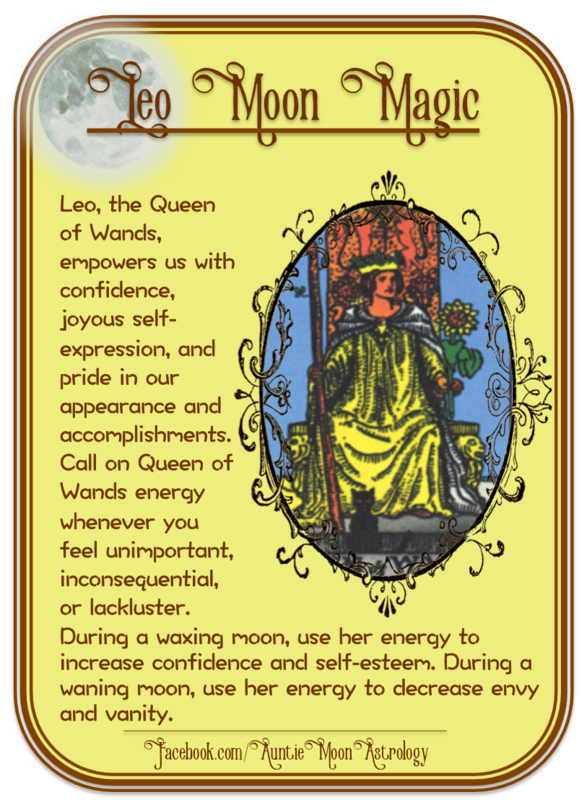 The Queen of Wands shows us feminine leadership, undaunted self-expression, loads of confidence, and feminine mystique bound with the spirit of fire.